4 Chicks: where did they go? 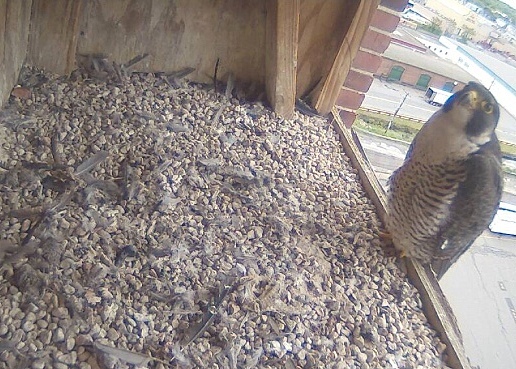 A year ago, a frantic email came in, with a desperate question from a teacher with a group of students, on what happened to the peregrine falcon chicks? From time to time, they huddle just under the camera and just out of sight. At first look, a regular viewer might think they jumped from the box, or something else. No worries, just momentarily out of sight! Moments later the female showed up with yet another fresh catch for breakfast! ← Falcon Cam provides terrific views!